We invite you for a free day trial! The package deals may include facilities in acquiring H+Co Communication Services. For instance, consultancy and diagnosis for your company, start up or project’s communication needs, press release, website, institutional video, social media and more. 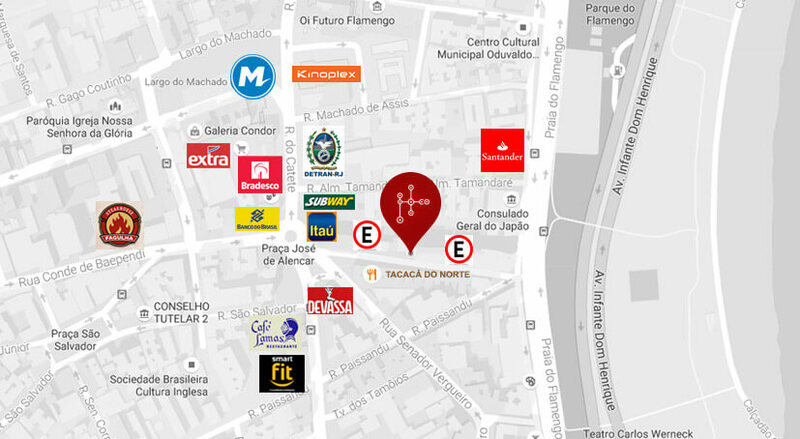 We are located in Flamengo, one of the South Zone’s closest neighborhoods to Downtown Rio. It is a 4 minute walk from the Largo do Machado Underground Station, and a 13 minute car ride from the Santos Dummont Airport. The neighborhood surrounding us offers many choices of restaurants, banks, gyms and supermarkets. We are 6 minutes away from one of the most charming meeting places in the city, the São Salvador square. 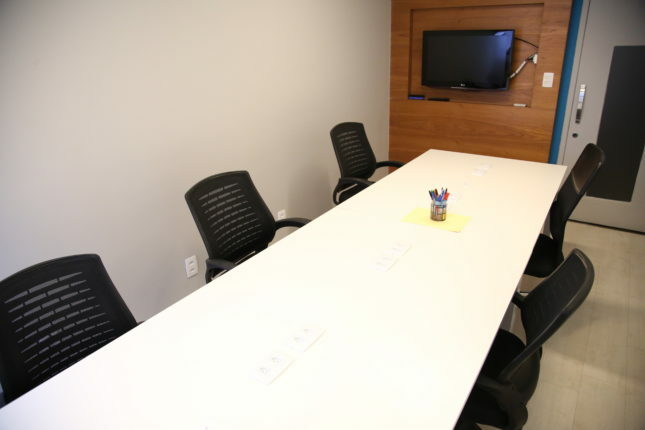 We have a number of package deal prices that you can check out here in our website.Designated Workspaces, where you can choose a spot to be only yours; Flexible Workspaces; Day Use Fees; prices for using Meeting Rooms; but we encourage you to come in and talk to us. This way, we can come up with customized solutions for your specific case, including the possibility of integrating high quality communication services. IP Telephones with URA, Voice Mail and DDR. Consultancy / Diagnosis: you will have a 1 hour interview with a senior journalist from our team, so they can further understand in detail the moment your company is in. Then, you will receive a diagnosis with suggestions on how to start your communication investments, for instance: is it more important that you firstly create a website, or a social media page? Is it better that you make a first contact with the press through at press release, or that you invest on an institutional video for the internet? The communication universe today is vast, and all stages are necessary, but planning ahead is always the best way to go. Press Release: a text that will guide the press on news about your business; It can be an institutional text, explaining generally or specifically about a service or a product that should be highlighted. Our releases are made as newspaper pieces, with a title, subtitle and text well argued so they will be welcomed by the press. Website: Nowadays, no need for further explanations on that; we visit several daily, from News to Shopping websites. Videos: we have the team and equipment for professional videos, of all kinds, for the internet. We make from exterior shooting to studio, always with editing and finalizing included. We can also make animations and infographics, depending on your needs. ** Come in and talk to us on how you can get great discounts on our package deals. Our solutions are projected for each kind of project. 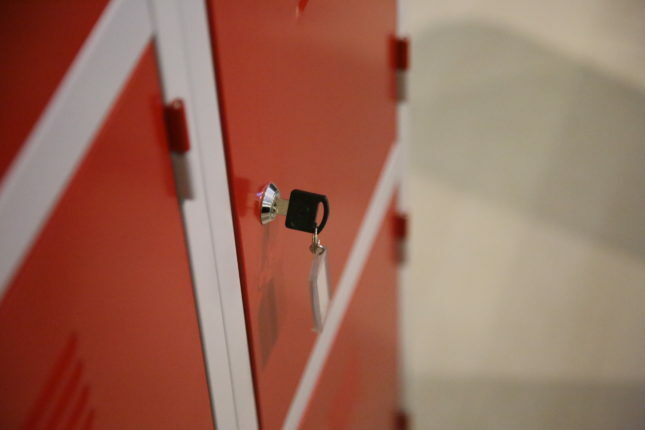 Use the Coworking from Monday to Friday, from 8am – 7pm. Includes using 10 hours of the Meeting Room. Use the Coworking from Monay to Friday, form 8am – 7pm. Meeting Room "+" and "Connect"
(Português do Brasil) Existe stalker do bem? We’ll contact you soon. Thank you.